Radio frequency identification, RFID, refers to variety of wireless technologies that create communication between a tag and a reader. The tag can be embedded in wristbands, badges, plastic cards, and other products that guests can carry at an event. Nowadays it even become a fashion statement, a trend at the millennials to wear the wristband even after the event ended as a statement or fashion trophy to brag on their attendee at the hype event. 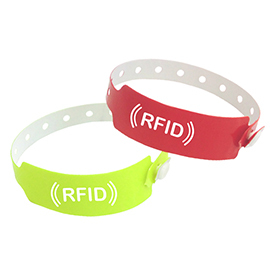 Choosing RFID wristbands as the identification system at your event can enhance the event on multiple levels. Not only it will satisfy your guest, as it features give huge benefits to the guest management but also could benefit for you as the event organizers. At the entrance gate, the guests only need to bring their wristband as the ID and the ticket to get into the event venue. To get in they just need to tap the tag to the reader machine, so it minimizes the human error also eliminated the unnecessary long line. An efficiency cost which turns to effectivity. No money and credit cards are needed for transactions during the event. Cashless payment system being applied with guests top up credits on their RFID wristband, with the recent trend of the organizer to provide guarantee for the left-out credits at the account can be transferred back. No need to worry about the theft the unnecessarily spending credit! The event software makes it possible for the guest to connect to their social media with just on swap or tap at the photo booth or the ‘likes’ booth that the event organizer provide. So their participation will be known widely without hustle bustle to take out their gadget during the crowded moment. If you would like to know more about the latest event software technology, you can contact PouchNation!